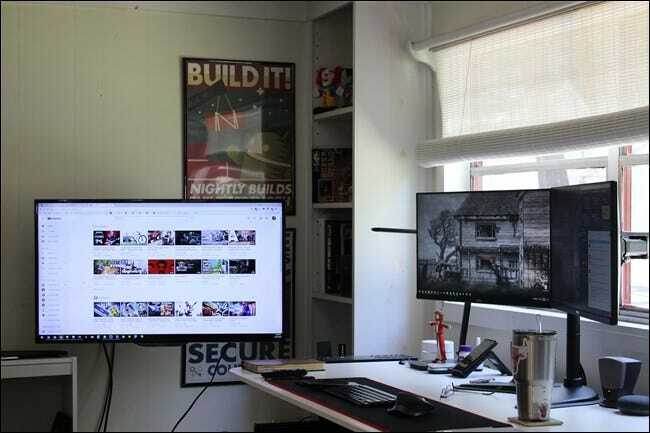 If you have a home office or specific space for your desktop PC, adding a TV to your monitor setup is a great way to add an incredible amount of versatility to your workflow (or play). That’s why having a sometimes-on, optional second (or third) display can be a godsend when you need it, and a TV is the perfect option for that. You can use it as an auxiliary display when you need it, an excellent movie-watching platform when you want it, and a great way to game on a bigger screen during your downtime. It’s a win-win-win. I recently added a TV to my computer setup, and it’s one of the most useful things I’ve ever done for exactly these reasons. The best part is that if you pick the right TV, it will be sort of “always on”—even when it’s turned off, it’s still sipping power so your computer will still see it as turned on and connected. Why is that a big deal? Because when you disconnect a screen from your computer (even just turning it off), the GPU will reconfigure the other screens to offset the change. That is exceptionally annoying if you’re looking for a sometimes-on display. So for that type of setup, a TV is the perfect answer. 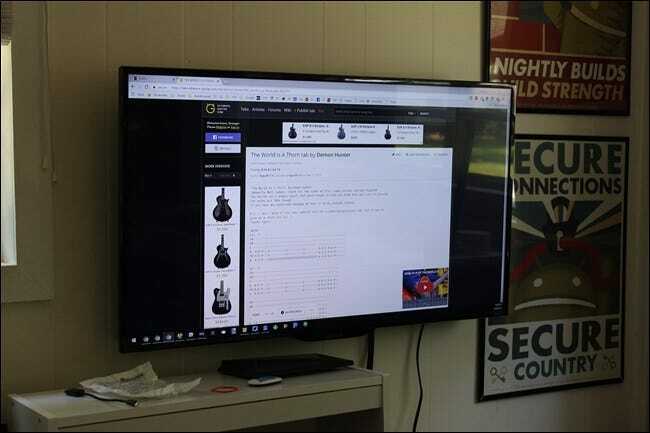 If you’re looking to add a TV to your computer setup, you don’t have to get the biggest, best, or nicest TV out there—unless you just want to, of course. But if this isn’t going to be your “main” TV, there isn’t much reason to spend a lot of money on it. You also don’t need something as super-crisp as a good PC monitor because it’s going to be serving auxiliary duty. I’m using a 39-inch Insignia Roku TV that I picked up at Best Buy for a couple hundred bucks. If you’re looking for something similar and don’t want to deal with Best Buy, this 40-inch TCL Roku TV on Amazon is also a killer option. There are, however, some things to consider. If you’re looking to use a TV as a second or third monitor, then display resolution is going to be crucial. While Windows has come a long way when it comes to handling ultra high resolution display, it still may not be the best idea to go with a 4K panel—especially if your existing monitor(s) is running at a lower resolution. This will just keep things simple when it comes to configuring your newly-added display and keep things clean when it comes to turning it on and off if you don’t plan on using it full time. So, for example, when I was looking for a new screen to add to my existing setup, I knew I wanted a 1080p display. I currently have two monitors that I use full-time, and they’re both 1080p, so adding a TV with the same resolution only made sense. This way, there’s no adjustment when I need to add the third screen to my workflow. I turn it on, drag whatever I need to it, and it just works. It’s simple. Of course, you also have to consider your intended use. If your GPU can handle it and you want something higher resolution for gaming, then by all means: grab a 4K screen and have the time of your life with those high-res texture packs. You’re going to want to make sure the TV has enough HDMI ports for your needs—especially if this is going to be a multi-use system. 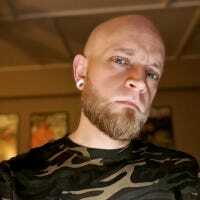 If you’re going to add it to a computer but also want it for other reasons—like console gaming, for example—you’ll want it to have the proper port support for it. The good news it that most modern TVs should have at least a couple of HDMI ports—probably even more. These should also have HDMI CEC, which may or may not be that important to you. Again, it all relates to how you plan on using the screen. Placing your TV depends on your current system setup and how much room you have, but most people probably don’t have room on their desk for a TV. In that case, mounting it to a wall near your PC is the way to go. For my setup, I have the TV mounted to the wall adjacent to my PC. It’s mounted to an articulating arm, which allows me to use it in a variety of scenarios. For example, if I’m watching a livestream of some sort that I need to follow closely, I can pull the screen away from the wall and closer to my monitors. It’s still a slight head turn away, but it’s not hard to keep an eye on while also doing other things. On the other side of that, I can also use it as a passive screen that only shows information I want to see sometimes—like weather, currently playing music, or the like. The TV screen also works as my “hobby screen” when I need it to. I play guitar, so I throw guitar tablature on my screen when learning new songs, making it easy to follow along. It’s definitely a multi-use setup, so the articulating wall mount makes the most out of it for me. But you could go in a couple of different directions with this—if your screen will be next to your existing screen(s), then there’s no reason to go with a flat wall mount. 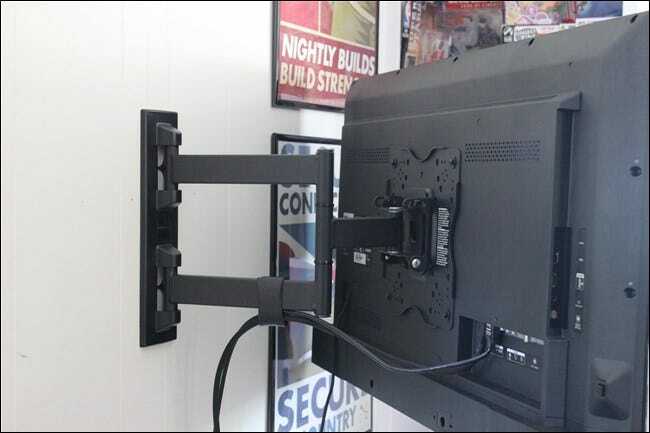 If your desk is big enough, you could even do an articulated mounting arm—just make sure it can handle a big screen like a TV. While adding a TV screen to your PC setup may not be something you’ve considered, the practical application here is pretty vast. You can get a very large screen for not a lot of money, use it when you need it and tuck it away when you don’t, and just overall have a very cool setup.